Several years back, I decided to leave my job as an office manager for a doctor's office. I fell into a position which allowed me to think outside of the box. Something not as confining as sitting behind a desk everyday. I became an assistant to Whitney Houston's. One of the first times I was over, her sister-in-law Pat (an amazing, caring and sweet lady) was cooking spaghetti dinner for us. Whitney and I were sitting on the couch watching a show. She was telling hilarious stories about different people she knew who came up on the t.v. screen. Pat and Whitney were commenting back and forth as I sat there cracking up. They were so loud and fun together. 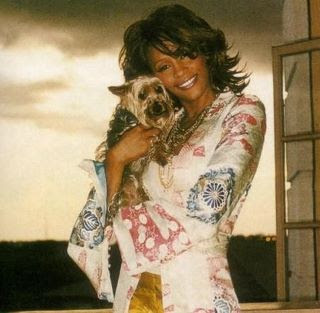 During this time, Whitney's adorable little Yorkie, took a liking to me and he curled up on my lap. She apologized and tried to call him over. I told her, "Don't worry, I like dogs." She smiled and said, "He usually never likes anyone else." Being new and not knowing how to take it, I was worried that she might be annoyed that her dog was staying with me while she continued to try to call him over to sit on her lap (you hear all kinds of crazy stories about stars.) But not Whitney, she just gave me a huge smile and said to her dog, "Okay, I see how it is, you like to sit with the pretty lady." "What?" I thought to myself, "Whitney Houston thinks I'm pretty?" After that, I realized how down to earth she was. She treated me like a friend, not someone who was working for her. One day when I was getting ready to go shopping, I asked her if there was anything she wanted in particular. She said, "I'm not sure, maybe I'll just go with you." I became a little nervous, she didn't have any bodyguards to go with us. What happens if people recognize her and she gets mobbed? What if she has a crazed stalker fan? My mind was racing, trying to figure out a way to keep her from going with me. I'm not a trained black belt or anything...but I do have quite the mouth and could give somebody a good sharp worded, tongue lashing. Not sure how effective that would've been though-lol! She insisted on going however, put on sweats, a baseball cap worn low and big dark sunglasses. To my surprise, no one recognized her. We walked through the store without a single person glancing twice. It was funny to see her pick up the Enquirer in the check out line, look at her picture and some crazy caption about herself. She laughed, put it down & said, "What'll they come up with next." Whitney definitely had her struggles, but I was with her during a time that she was completely cleaning up. I was lucky enough to get to see the true side of her. She was NEVER a diva with me, which I appreciated. I don't think I could've handled being around someone who treated me "less than." During my time with Whitney I became close with her daughter Krissie while driving her around, shopping, to school, friends houses, dances...etc. It was fun to see the two of them interact together. Just a normal mother/teen daughter relationship. Krissie saw Whitney as just 'her mom' not the superstar the world saw her as. Whitney would often roll her eyes and say, "She doesn't think I'm cool & gets embarrassed by me." It definitely made me feel better as I told her, "Join the club, I think I'm a cool mom, but my teen boys don't either." 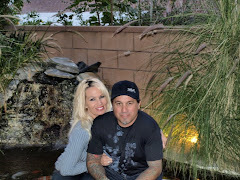 We'd laugh and talk about the 'joy's' of raising teenagers. Luckily teenager's grow out of the "embarrassed by their parents stage" and can have a close, loving and caring relationship with their parents...as was evident with Whitney & Krissie in their later years. One particular day, I was driving Whitney to pick up Krissie. A Prince song was playing on the radio. I turned the music up and said, "He is my ALL TIME FAVORITE...I LOVE HIM!" Forgetting for a minute that I was sitting in the car with Whitney Houston...not a normal friend. Oops...I quickly realized my mistake as she turned and smiled and said, "Ya, he's pretty cool." I stammered, "I mean, YOU ARE TOO! I've grown up listening to you and you're amazing. Wait..not that you're old, you're only 3 years older than me." She started cracking up and said, "Okay, you can stop now." Then she started singing to his song, her voice ringing with perfection throughout my car. She stopped for a minute to clear her throat and said, "This dry California weather makes it a little tough on my voice." Then she started up again. I sat driving and listening to a private concert. Then I had a crazy idea, "Should I do it? I don't know, I don't want her to stop singing," I thought to myself. "What the heck, I'll do it, I may not get another opportunity like this!" I began singing along with her. Yes, me and my not so great voice. How many people can actually say they've sang with Whitney? Well people, I rose up, and with unfailing courage, I sang a duet with one of "THE GREATEST SINGERS OF OUR TIME"...WHITNEY HOUSTON. Rest in Peace Whitney and thank you for always treating me with respect. Se n'è andata una grande artista della musica mondiale è dispiaciuto molto anche a tutti noi.Riposi in pace. (ps)...Come stà Baby Ariella ???? Very cool story Lisa. What a tragic shame and loss. What a wonderful story! Thank you for sharing that. Amazing, thankyou for sharing. I cant believe such a beautifully talented lady has left this world. RIP you gorgeous being. Its such a wasteful thing for the world to have lost such a beautiful and wonderful singer like Miss Whitney Houston. And Lisa, how lucky you have the chance to get to know the real her and not the one I/we often read in magazines, webs. May her soul rest in peace. I bet she's singing for God in serene.